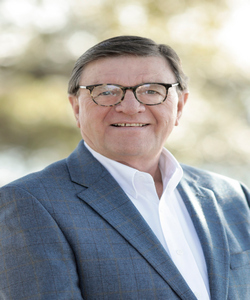 During his career as a faculty member and administrator at the Medical University of South Carolina (MUSC), Ed was often closely involved with the acquisition of new space through the construction of new buildings, purchases, and leases. Through these experiences he developed a strong interest in real estate, and learned the importance of research, analysis, negotiation, communication, and follow- through. After retiring from MUSC, Ed founded a real estate development company and established neighborhoods in Mt. Pleasant and North Charleston. While working with prospective homeowners, Ed enjoyed helping them translate their dreams and needs into spaces they would call home, and then guiding them through the entire purchase process. After those projects were completed, Ed and his wife, Gretchen, decided that they would move to Beaufort where a son and his family already lived. They are currently building a home in the Habersham neighborhood. At the Berkshire Hathaway HomeServices Bay Street Realty Group, Ed found a full service real estate firm that reflected his interest in the total range of real estate. From new developments, to resort properties, to historic homes. From first-time home buyers to people looking for a vacation home, as well as those folks interested in downsizing for their retirement years. When he’s not working Ed likes to write and ride his bike on the Spanish Moss Trail. He has also been involved in several charitable and community projects over the years. He and Gretchen have made mission trips to Thailand and Poland, and Ed participated in a prison ministry for several years. He is currently serving as a guardian ad litem, representing the rights and interests of children in a variety of legal situations. Ed looks forward to helping you with any of your real estate needs.